Imagine being trapped in a Pennsylvania coal mine cave-in. You then come under the spell of Nirvano gas, which places you in suspended animation for 500 years. This is what happened to World War I pilot Buck Rogers in 1928. When Buck awoke, it was the 25th Century, setting in place a scenario that allowed the imagination of authors, scriptwriters, costume, set and toy designers to run wild. Buck awoke to a world rampant with greed, hate, suspicion and war. He found allies in Wilma Deering and scientist Dr. Huer. Of course, evil was well represented by Killer Kane and his henchmen. 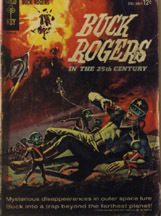 Buck Rogers was created by Philip Nowlan for Amazing Stories in 1928. As with most of the characters created in the Depression Era, a time in which World War II was looming on the horizon, Buck Rogers was a fighter for freedom and justice. Set in the 25th Century allowed the use of imagination in the plots of the stories. Buck was involved in space travel, futuristic cities, ray guns and after World War II atomic weapons. Buck Rogers quickly moved onto the daily and Sunday comic pages. This was the Golden Age of the Sunday comics pages. Each week a full colour page of panels to detail that weeks adventure. The Sunday comic pages from this era are valuable in their own right. On November 7, 1932, Buck Rogers moved into the new medium of radio. He debuted on the CBC radio network. The recordings of the old broadcasts can sell for large sums in the market place. Radio in the 1930's - early 50's was the medium that was employed to sell products. Over the years Buck Rogers was sponsored by Cocomalt, Cream of Wheat, Corn Post Toasties, Kelloggs, The wide product range of sponsors offered through the years: space helmets, ray guns, kites, rings, badges, cutout figures, popup books and costumes. Hundreds of giveaways and products were available to kids and collectors. Buck Rogers Strato-Kite, 1930's In the 1930's there was a Saturday matinee serial starring Larry Crabbe, better known as Buster. In 1950, a short-lived television series aired. It is believed that none of the tv episodes were recorded and have been lost to history. In 1970's Buck Rogers aired as both an animated tv series and a regular series . But, the Golden Years for collectibles of Buck Rogers material was in the 1930's - 1940's. Products connected to Buck were some of the first to be mass marketed through department stores including Macy's, Gimbels and the JL Hudson Company. In the mid 1930's the Macy's Herald Square Store home to the annual Thanksgiving Parade had a rocket ship ride to visit Santa Claus at Christmas time. 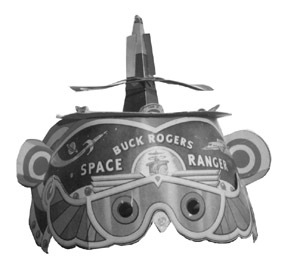 In addition to products manufactured for sale by such companies as Daisy and Louis Marx, Buck Rogers items were used as inexpensive giveaways by radio sponsors. For a few cents and several box tops, one received a ray gun holster from Cream of Wheat or Daisy. Just perfect to fit the ray gun in. Cocomalt made available cut-out books of action scenes of Buck and Wilma fighting Killer Kane. Many of these rare items now sell for hundreds of dollars. The Depression Era was a fertile time not only for toys, but a time for the use of imagination. The 1930's were the Age of World's Fairs - the most famous the 1939-40 New York World's Fair. But, in 1933 at the Chicago Century of Progress Exposition, there was a Buck Rogers display and children dressed as Buck and Wilma passed out buttons reading, "I saw Buck Rogers". Another marketing tool employed in the 1930's was the use of country fairs as avenue to distribute and sell merchandise. Kids would be invited to come to the local airport and greet the arrival of the Buck Rogers airplane. Upon the plane's arrival, Wilma Deering would disembark and the distributors would sell Disintegrator Pistols and other space toys connected to the show. Some of the boxes would be autographed by Wilma. A gun in a box with a Wilma autograph would fetch several thousand today. The Daisy Company over the years produced seven different types of Disintegrator Pistols. The first one was the Buck Rogers Rocket Pistol XZ-31. The pistol was constructed from heavy gauge blue gun steel with a nickel plated trim and it made a "zapping" noise. The XZ-31 was 91/2" long. In 1934 it cost $.50. In 1935 Daisy hit the stores with the XZ-35. It was two inches smaller and sold for $.25. In 1936 the 91/2" pistol returned, but with new improvements. The pistol produced sparks which were intended to simulate a deadly disintegrator ray. This model contains the inscription "Buck Rogers 25th Century Disintegrator", plus a picture of him. Also in 1936 Daisy manufactured a Liquid Helium Water Pistol. This gun is sought after by collectors for several reasons: it has a futuristic design, it is in vivid yellow and red colours and the pistol could fire 15 bursts of water before requiring refilling. After World War II the Disintegrator Pistol became the U-235 Atomic Pistol and was painted in a bronze/gold colour. About one million were sold. The guns quality was cheaper than the 1930's versions due to the shortage of metal after the war. Daisy in conjunction with the issuing of various pistols moved into the selling of accessories - holsters and helmets. Each item was sold in a complete set or could be purchased separately. The Buck Rogers helmet resembles a World War I flying helmet, made of leather it had a small radio antenna, earphones and a visor. The helmet was perfect for interplanetary travel. Sold for $.39 cents with a more deluxe version going for $1.00. Holsters sold for $.25 to $39 and complete combat sets ftom $.50 to $.89. Ads appeared in the comic books of the day with Daisy offering the Buck Rogers Atomic Pistol Holster Set, which included the 10" pistol which made a loud "zap" noise and flashed harmless red sparks when the trigger was pulled. The holster was a "real, two tone leather belt, straps, nickel plated buckle in the 25th Century style". Also included was a Commando 30" long gun with pump action. The entire cost for this futuristic weapons arsenal $1.59 plus $.11 for postage. Does anyone care to guess the value of this item today? The piece de resistance in wearing apparel was marketed by the Sackman Brothers of New York. A complete Buck Rogers outfit. A knitted jersey shirt with the Buck Rogers medallion, vestee, breaches, leggings, helmet, holster and pistol sold for $4.50 in 1934. Or it could be ordered by using Cream of Wheat box tops. I wonder how many tons of Cream of Wheat had to be consumed for this premium. 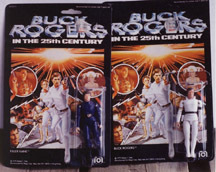 Two major manufactures of Buck Rogers toys were the Louis Marx Company of New York City and the Tootsietoy line by Dowst Manufacturing. 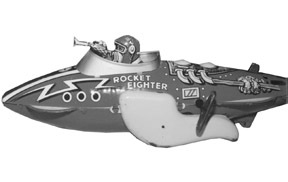 Marx manufactured several Buck Rogers windup rocket ships in 1934 and 1939. Made of tin and with beautiful colourful litho graphics the items are sought by collectors. The 1939 Police Patrol Rocket is a key wind which flies across the floor sparking as if in space flight. One item that collectors search for is the Louis Marx manufactured roller skates. Test marketed in 1935 only one pair is known to exist with its box. Tootsietoy produced rocket sets in 1937 and 40. Diecast metal. The 1937 edition contained four ships and figures of Buck and Wilma. String was included in the box to be employed to make a pulley so that the ships could be hooked to it and appear to be moving through space. The ships brightly coloured are 5-6" in length. The company sold ships individually in their own boxes for $.25. Radio sponsors issued hundreds of giveaways. Kellogg's in 1933 issued a book on the origin of Buck Rogers, Cocomalt even issued catalogs of what premiums were available through the mail. Items such as the Buck Rogers Solar Scout badge, maps and the Buck Rogers Cut-Out Adventure Book. Cream of Wheat issued a beautiful medallion with Wilma Deering's image stamped on the front. On the back was inscribed "To my pals in the Solar Scouts". As a member in good standing one could order a Buck Rogers Secret Repeller Ray Ring which was to be used on all scout club documents and correspondence. But, the rarest of the Cream of Wheat items was the 1936 set of figures of Buck, Wilma, Killer Kane, Ardala, Dr. Huer and a robot. It was manufactured by the famous Britains Company. The last major release of material was in connection to the tv show of the late 1970's. There were two sizes 33/4" and 12" figures. To compete with the success of Buck Rogers King Features of Chicago in 1934 entered the realm of space adventure. Blond, handsome Flash Gordon was created to compete with Buck Rogers for the space market. Cartoonist Alex Raymond created Flash and the first strip hit the newsstands on June 7, 1934. The Flash Gordon comic strip art is considered to be some of the best artwork ever to appear in such a forum. Flash started out as only a Sunday strip, but due to its popularity was expanded into a daily strip shortly thereafter. Unlike Buck Rogers - Flash lives in the present world and travels in a space ship. The majority of his adventures are spent on trips to the planet Mongo to fight Ming the Merciless. Just as Buck he has a female companion Dale Arden and a scientist associate Dr. Hans Zarkov. Flash Gordon employed death rays and rocket ships, but he also used a sword and fought dinosaurs, jungle warfare. The wonderful thing about fighting on Mongo was its diverse cultures and inhabitants. In the 1930's he became like Buck Rogers a marketing delight. He was featured on radio, books - including the famous pulps, comic books, gum cards and toys of all types. In the late 1950's Flash would make the move to TV. Flash Gordon merchandising was perfect for the Depression Years. The bottom of the Sunday comic strip would include offers for mail away premiums connected to the newspaper or its many sponsors. Prior to tv this was the way to get at the consumer. One could join the Flash Gordon Fan Club which was sponsored by the Chicago Herald and Examiner. Members were allowed to wear a Flash badge to indicate membership and of course were entitled to various member rights and privileges. In the 1930's a Flash Gordon Signal Pistol was manufactured. On the side was a seal depicting Flash. When the trigger was pulled, a siren sound was emitted. In the late 1940's a Flash Gordon Air Ray Gun was manufactured by the Budson Company. The gun had a lift-up top section which when pushed, fired a blast of air . The box is decorated beautifully with Flash and Dale. In the 1950's the Louis Marx Toy Company issued the Flash Gordon Water Pistol. It is 7" long and made of sculpted blue plastic. The pistol contained a whistle mouth piece at the end of the grip. Like Buck Rogers - Flash Gordon had his own movie serial in the 1930's. Like Buck - Flash was played by Buster Crabbe. The first serial in 1936 was Flash Gordon, the second in 1938 - Flash Gordon's Trip to Mars and the last in 1940 Flash Gordon Conquers the Universe. There are many items connected to the Saturday matinee and the most prized is a Flash Gordon outfit sold in 1936 in conjunction with the second serial. A blue and red shirt with a white sun burst containing the words "Flash Gordon", a pair of brown pants. Marketed only in the Christmas season and it very rare a collector should expect to pay in the several thousands. As it did with the Buck Rogers space ships, Louis Marx sold a Flash Gordon rocket ship in 1941. Like all the Marx space ships - bright tin litho and a key wind mechanism to allow the ship to spark and travel through the universe. The ship is bright red and yellow and the on the nose is painted "Flash Gordon". The fin on one side of the ship is inscribed with the #5 and the fin on the other side inscribed with #5 and "Flash Gordon". The key wind is located behind the fin and on the top of the ship is a metal stop and go handle. Marx employed the same concept in the 1950's when it manufactured a Tom Corbett Space Patrol sparking space ship for the tv show. Another high end value item from 1934 is the Flash Gordon Metal Characters Casting Set. It was sold by Home Foundry Company of Chicago, Ill. The set contained casting molds of figures, lead bars, an electric heating element and pan to pour the molten metal into the molds. In addition the set contained paints, brushes, and various other tools. The casted figures stood 2 1/4" and included Flash riding a horse, Dale Arden holding a rifle. Other molds could be ordered through the company. The set came in a beautifully decorated box with Flash and Dale on the cover and is very rare. Of course it is interesting because it could not be sold to children today. With the health and safety laws it would not be legal. There are videos available from the 1950's from the little seen Flash Gordon tv show that starred Steve Holland and was filmed in West Germany. Interesting in black and white if one can find a copy of the video. I remember watching this show as I was growing up in New York City and several years ago did come across a video which I added to my collection. The show aired on the old Dumont tv network which is long gone. Dumont was home to the original Honeymooners Show. An interesting football hit the market in the 50's with Flash. Interesting in that it contained wings on the side. In 1952 the Premier Products Company of Brooklyn, New York issued a Flash Gordon Solar Commando plastic boxed set. Three small space ships (a blue one, red one, and gray one) and two space figures. Through the years Flash Gordon and crew have gone and then been revived. In the 1970's Mego Industries sold 8" figures of Flash, Dale, Ming the Merciless and Dr. Zarkov. The figures were on a blister pack and were dressed in brightly colored uniforms with helmets. The figures came with swords and various other weapons. Some of the last material was manufactured in the late 80's for a series called Defenders of the Earth. Then in the late 90's for a tv series that aired in the US. As far as I know the figures were not sold in Canada since the show did not air here. Of course the age of items can be estimated by the type of material. Metal prior to World War II and after the war plastic and paper in large numbers. After World War and the advent of television other space shows hit the air waves. The early to mid 1950's saw other space heroes fighting various evil. In the UK there was Dan Dare - Pilot of the Future. Many items were sold in connection to Dan Dare including a beautiful pop-up book. Dan Dare appeared on issue No.1 of the Eagle National Strip Cartoon Weekly on Apri1 14, 1950. Other items have been marketed over the years including spinner saucer guns and rings. On this side of the Atlantic there was: Captain Video and His Video Rangers on the old Dumont tv network, Tom Corbett Space Cadet, Rocky Jones Space Ranger, Space Patrol. Many items were issued by the sponsors of the shows and Captain Video appeared in one of the last serial movies in theatres. 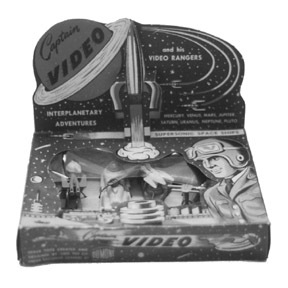 Lido toys sold a beautiful bright plastic set of Captain Video toy space ships in a 3-D box. Each box contained four different space ships with radar aerials, weapons and some even had tiny rubber wheels for landing. The back of the box featured Capt. Video and his partner in a cardboard cut-out and a badge that could be worn for the club. Tom Corbett had a Marx space ship that sparked and the front of the ship featured Tom and the crew peering out of the window watching the space debris ahead. In addition Marx sold large playsets of Tom Corbett and other space themes. The playsets in their cardboard boxes are becoming very difficult to find and secure. Not as many appear at toy shows. Space Patrol which aired on March 13, 1950 was sponsored by Ralston Purina. It was the leader in product giveaways in stores or by mailing in various product flaps. One could receive picture cards or guns and holsters, cardboard space helmets from the box or to mail away for. Some manufactures of toys connected to the show were Toys of Tomorrow Limited, U.S. Plastics and Plastic Novelties Inc. One of the most valuable items connected to the show as marketed by Toys of Tomorrow Limited - it is a Monorail space ship for the "Children of Today". So long before Star Trek and Star Wars - space heroes have been part of North American pop culture. Fighting evil on the plant and in far away star systems. A lifetime and fortune can be spent on trying to find the items connected to this mostly long gone shows.